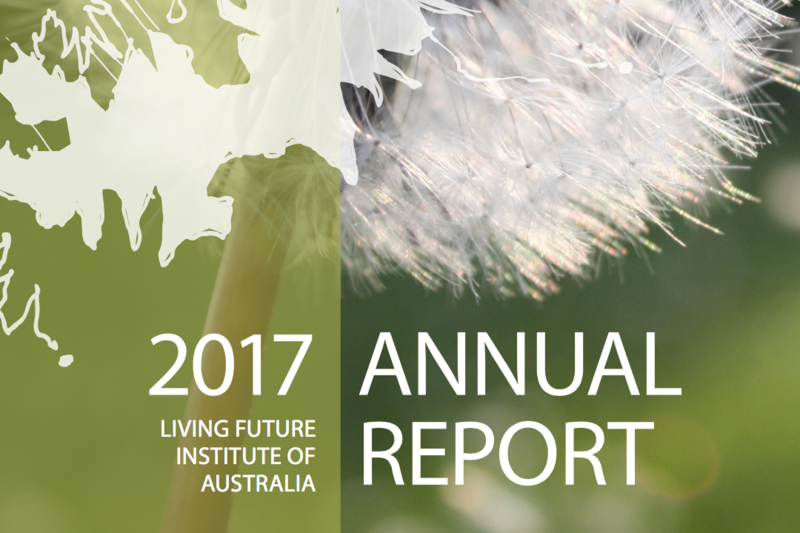 It has been a transformative year for the Living Future Institute of Australia (LFIA). I was very honoured to be chosen as the new Chair at the 2016 AGM, taking over from the wonderful Mary Casey. In my first year as Chair I have been blown away by what we have achieved and the amazing people and organisations that have supported us. In late 2016, we were delighted to appoint one of the LFIA’s previous Board Directors Stephen Choi as our first Executive Director. Throughout the year, Stephen has provided an extraordinary contribution to the LFIA and led the organisation in achieving some significant milestones. We welcomed some fantastic new Board members in late 2016 and collectively the Board set some ambitious targets for 2017. This included partnerships and sponsorships, events, increasing our following, launching Declare and offering new services. I am pleased to say that we have made significant ground across these areas and continue to grow the presence of the LFIA and a strong network of individuals and organisations that want to work with us to create a Living Future. A future that is socially just, culturally rich and ecologically restorative. 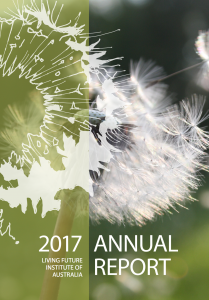 As you read the annual report you will get a sense of what the LFIA has achieved over the past 12 months. It’s hard to pick just a few personal highlights but here goes. Firstly the completion of our legacy project, the installation of solar PV system on the winning design competition school in Melbourne, which will obviously reduce carbon and save money but also importantly allow that money to be reinvested in other important education programs for many years. Secondly are some of the events we have held this year. In particular the Forum and inaugural Symposium. The quality and enthusiasm of both speakers and attendees made these very memorable events and something that we will build on over the coming year. Next is the launch of Declare in Australia, which now allows the LFIA to issue Declare labels to products locally. A number of products have already received their labels and this will continue to grow in 2018. It also inspiring to see the interest that is building towards Australian projects targeting the Living Building Challenge (LBC). The Australian property sector has notched up some significant achievements in delivering green buildings however some of the upcoming LBC projects will take this to the next level. The LFIA will continue to support these projects and hope to share more with you about them in 2018. Finally, I want to give a special mention to some Board members whose term has come to an end. Mary Casey, Caroline Pidcock and Brian Coughlin have collectively contributed immensely to the LFIA over several years. On behalf of the LFIA we thank them for their contribution and look forward to their support in other capacities in future. To everyone reading this, your support is vital for us to continue making an impact towards a living future. The financial support we have received over the past year has been amazing. We will also continue to call on your voices and actions as active proponents of a Living Future, and request your feedback and your commitment to change. We thank each and every one of you; our supporters, our partners, our volunteers, staff and Board members for your efforts and support during the year. We couldn’t achieve what we do without you.